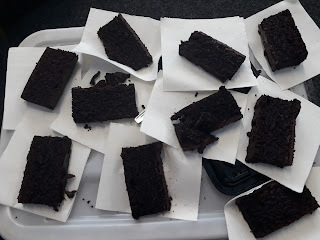 For math today we had to do decimal's and fraction with cake. We cut into 10 equal pieces. The whole cake was 18cm long and one slice equalled to one tenth. Miss Stone measured the slices to make sure that they were all completely even. If we cut 1/10 into two pieces and that is equal to 1/20. A the end some of us got to eat the cake if we answered a decimal question. Well done for blogging and sharing your learning! It is great to see that you remembered what fraction we would get if we cut the tenths in half. Do you remember what we would get if we cut the tenths into ten pieces?